bmiSMART Review: Does it Work? There are clinical trials which do support most of the claims regarding the suite of products in bmiSMART. The three products complement each other and present a rather comprehensive solution to managing calories in your daily intake. At about $225 for a one-month supply, however, it is not for the more frugal dieters. Taking up to 16 pills a day also may not appeal to some consumers. If money and the number of supplements required each day are not an issue to you, bmiSMART could be an excellent addition to your weight loss journey. 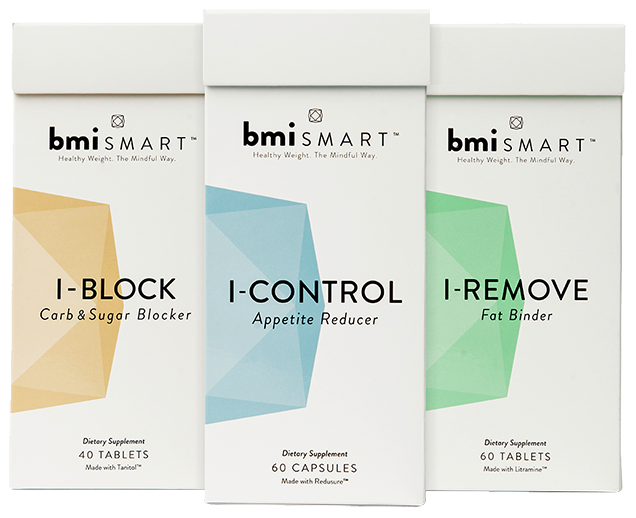 The product line called bmiSMART consists of three supplements that are designed to promote healthy weight and appetite control. Have you used it? We want your bmiSMART review. You can purchase any of the three bmiSMART products from the official website for $29.99 each. You can buy all three for a reduced rate of $74.97, saving $15 over the price of purchasing all three separately. The TV commercial below has been airing as of this April 2016 writing. There are currently three products under the “bmiSMART” umbrella: I-Block, I-Control, and I-Remove. Each is designed to assist in weight loss from a slightly different approach. Below we will take a closer look at each of the three products which make up the bmiSMART brand. I-Block is said to be a carb and sugar blocker. Its active ingredients are grape marc (Vitis Vinifera) and L-arabinose (Zea Mays). It is to be taken prior to eating a meal which will allow you to absorb less calories from carbs and sugars. Each packet contains two tablets which contain 1290mg of the proprietary complex called Tanitol™. For weight loss, you are to take 2 tablets twice a day before your two main meals. There are 40 tablets per box, which is a 10-day supply. By taking Tanitol™ prior to eating, digestive enzymes are inhibited from breaking down carbohydrates and sugars. This action prevents some of the carbohydrates and sugars from being absorbed in the digestive tract, thus reducing calorie intake. As a result, Tanitol™ helps individuals maintain a healthy blood-sugar level and manage weight fluctuations associated with carb and sugar consumption. Although we don’t know how much of each primary ingredient is included in this particular proprietary complex, we can take a look at studies on each component for a better idea. Reader reviews for those ingredients as standalone supplements are generally positive. I-Control is the appetite reducer in the set. It is to be used to suppress appetite before or between meals. The active ingredients are contained within the proprietary complex called Redusure ™ which contains konjac root (purified glucomannan), red seaweed (carrageenan) and xanthan gum. For weight loss, you are to take two capsules with liquid three times a day, 30 minutes before each meal. There are 60 capsules per box, for a 10-day supply. For weight loss, Konjac root provides a soluble fiber called glucomannan. A number of supplements contain this ingredient, and researchers believe that it works by absorbing water in the stomach and forming a gel, which makes you feel full longer by delaying digestion. Redusure can also be found in a product called XLS-Medical Specialist. I-Remove is the fat binder of the group. This is said to work best when you are consuming a meal containing fat, but still want to keep your calories low. A proprietary complex called Litramine™ is made from prickly pear cactus (Opuntia Ficus Indica) and acacia gum (Gum Arabic). Recommended dosage is two tablets with liquid three times per day, right after each meal. A box will give you a 10-day supply. Other products which use Litramine are XLS-Medical Fat Binder and Lipsinol. You may be interested in the rather extensive 2012 review of Liposinol by Diet Pills Watchdog, which gave the supplement a “rejected” rating. Keep in mind that although the supplement was listed as “rejected” it was conceded that there were “strong clinical trials” and that the ingredients were safe. It was also pointed out that there were no reports of scams or ripoffs by InQPharm. Fat binders have been shown to reduce caloric intake, but it should also be pointed out that they have little effect if you eat a meal with little or no fat. The two biggest concerns after reading the list above are regarding the products efficacy, and the cost. As shown above, there are studies which generally corroborate the positive claims for many of the ingredients in the bmiSmart catalog of products. The makers have done a good job of including well-received ingredients, while sidestepping some of the more controversial options (aside from red seaweed). Thus, the efficacy of the bmiSMART suite appears to be generally positive and well-documented. The only significant complaint we have about bmiSmart is that of cost. The complete suite of products will set you back about $75 – but that will only last you 10 days if you adhere to the recommended dosage. Thus, to use the full bmiSmart set for a full month will cost you about $225. Many of the individual ingredients of the three products above can be found online and in supplement stores. Consider the following. Grape seed extract – Perhaps the most popular of all of the ingredients listed here, grape seed extract can be found for about $12-$20 from a wide selection of vendors. L-arabinose – This ingredient is not often sold by itself, but is contained in a number of “sugar blocker” supplements. Konjac root – This popular supplement is produced by a number of vendors, ranging from about $10-$15. Prickly pear cactus – A number of prickly-pear supplements can be found for about $13-$20. Acacia gum – You can find bottles of acacia fiber for about $7-$10. If you are primarily only interested in one of the products above, and cost is of a concern, you may want to explore some of the alternatives shown in the list above. There are clinical trials which do support most of the claims regarding the suite of products under the bmiSMART umbrella. The three products complement each other and present a rather comprehensive solution to managing calories throughout the day. At about $225 for a one-month supply, however, it is not for the more frugal dieters. Taking up to 16 pills a day also may not appeal to some consumers. If money and the number of supplements required each day are not an issue to you, bmiSMART could be an excellent addition to your weight loss journey. Have you tried bmiSMART? Please give it a star rating and comment below. I only take I-CONTROL & I-REMOVE, but I lost 8 lbs in 3 months, when previously I had only lost a few pounds on my diet and exercise program. I have a difficult time losing weight in spite of being disciplined with my eating. This stuff really, truly made a difference. I’ll never be without it! What is the amount of caffeine in these products? There is no caffeine in any of their products. I’ve been on I-REMOVE and feel GREAT! I have a very very hard time losing weight, been on this for about 10 weeks now. I’ve finally seen the scale move, although I didn’t see any results until the 4-5 week mark.